A huge legend in a small body. The Lelit Mara is placed at the prestigious end of many home espresso machines. The legendary E61 grouphead inside an incredibly compact, full stainless steel body with a PID adjustable temperature controller of the boiler. 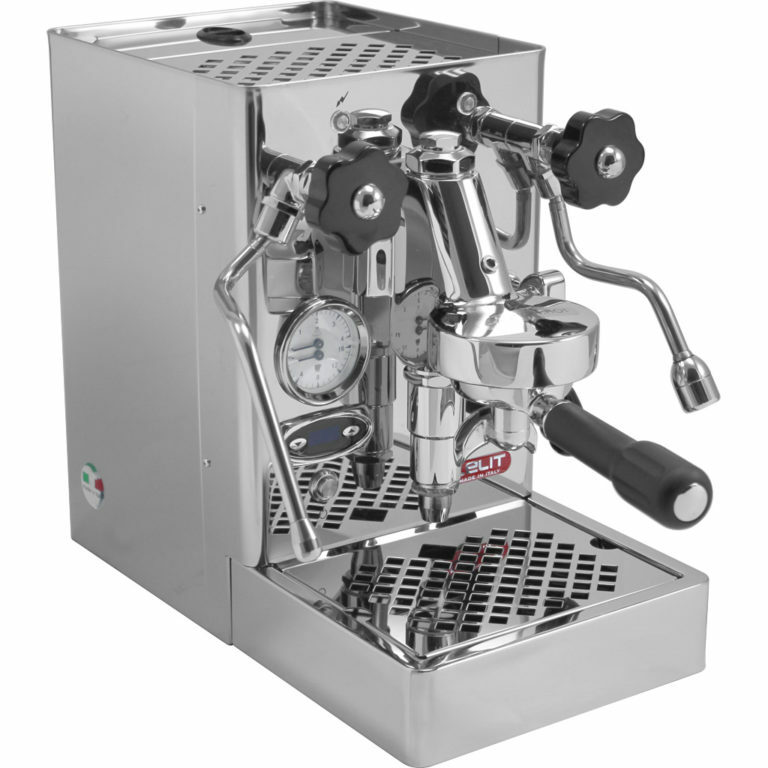 The result: a marvelous, appealing and super compact espresso machine enabling to apply baristas golden rules and extract the most tasty espressos and cappuccinos you can dream of. Stainless steel body: Polished to a mirror finish (exterior only). E61 grouphead: Hot water circulates from the heat exchanger through the grouphead and back to keep the grouphead to keep your portafilter nice and hot. PID temperature programming: Allows user to change boiler temperature through the use of the digital display/control panel on the front panel of the machine. The display reads out the current temperature of the coffee boiler. Polymer tubing connecting boiler to steam and hot water valves: Alimentary. Able to withstand high pressure and high temperatures up to 620 °F. Facilitates easier repairs. Most importantly, are limescale free. Dual pressure gauge: Top part measures boiler pressure (0 – 4 bar). Bottom part measures pump pressure (0 – 16 bar). Separate indicator lights: Left light is for power to indicate the machine is powered on. Right light is for the heating element to indicate when the heating element is energized. Steam / hot water wand: Multi-directional, no burn. Professional grade portafilters: Single spout and double spout handle. Each with 58 mm with Lelit logo imprinted on the filter head. Water reservoir with two stage shut off: One shut off is for when removing the reservoir. The second shut off is a magnetic float to power off the heating element when the reservoir is low on water. Manual resettable safety thermostat: Located on top of the boiler. Insulated copper boiler: Heat exchanger and thermo-siphon double cycle system to have the brewing group and the boiler always hot, at the right temperature. Internal pipes also in copper. Extremely low feet: Creates a very low profile. Removable power plug: Completely detaches from from machine. Accessories included: Dual spout portafilter, 2-cup basket, 1-cup basket, nice tamper, plastic scoop, blind filter basket/insert, instructional manual.